AIGA South Carolina: Charleston asked me to create the identity design of a new event called Design Graveyard. It was an incredible night and I got to collaborate with so many talented local people on everything from illustration to event design. One of my favorite parts was creating a custom display face that we were able to use on all the collateral. Although it can seem daunting to design a custom typeface in a little less than a month, the benefit of working with fellow designers is that not having time for kerning and spacing is actually ok because all your collaborators can do that for you as needed! (Eternal apologies to the type design gods because yes, spacing especially should be designed in tandem with letterforms but RULES ARE MEANT TO BE BROKEN). By the time I had created all the letters we needed for signs, etc. I realized that I was more than halfway through the whole alphabet and just went for it! Luckily I have another year to scheme additional display weights like fancy highlights and drop shadows! (and yes, of course, actually kern the damn thing). 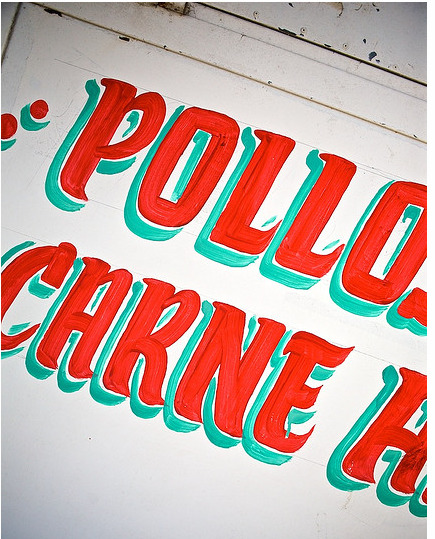 Given the Dia De Los Muertos theme I began by researching painted letters, looking especially for *actual* signs since there are already so many excellent sign painting inspired typefaces out there. I came across this image on Pinterest (if you know the original artist/ source please let me know), and used that as a jumping off point for painting my own letters. Specifically I was really drawn to the entry strokes, the form of the /A, and the wavy stroke for the top of the /E. The /Q is one of my favorites!